Bottom edge of poster has the text: "End The Air War". Bottom half of poster has a stylized drawing. A purple dragon exhaling smoke is depicted in front of a small Asiatic town. Behind this town is a field with two trees at right and the silhouettes of three figures at left, all three in large hats, and the leftmost figure is bending over. The sky behind these figures fades from pink at the horizon to red further up where it becomes stylized flames. Above these flames is the stylized image of a large black eagle in flight. 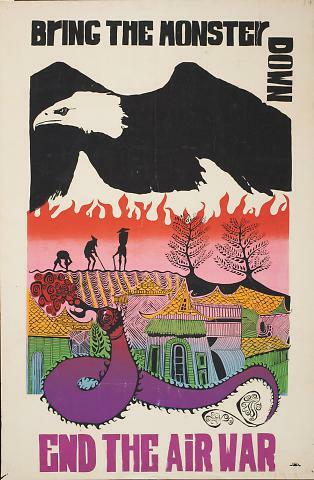 The top of the poster has the text: "Bring The Monster Down".